L.C. Blickenstaff (Director) & Marie Blickenstaff at camp. Taking trees from the shelter for planting. CPS Camp No. 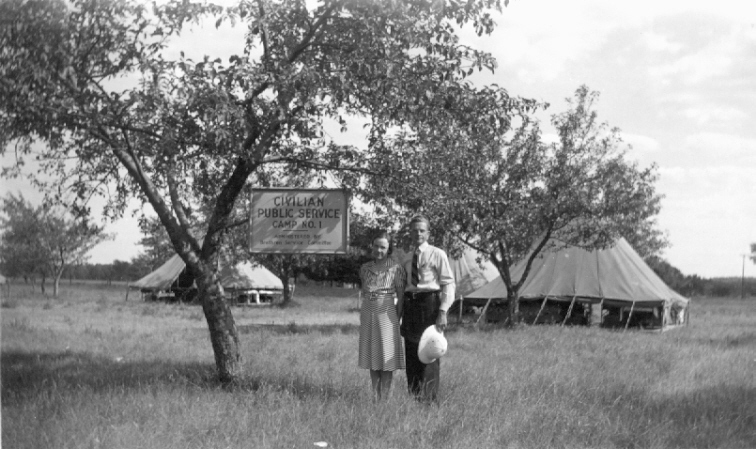 1, a Forest Service base camp, located in Manistee, Michigan and operated by the Brethren Service Committee, opened in June 1941 and closed in July 1941. Work focused on fire-fighting in fire season, along with preventative or preparatory work for fire control. The Manistee camp opened in Copemish, Michigan on the site of the Brethren work camp at the Joseph farm and remained open for one month. CPS No. 1, according to Eisan, was also known as Marilla and Manistee (p. 74). It moved to a new site at Camp Manistee for a year where it was called Camp Stronach, CPS Camp No. 17. The camp then moved to Wellston, Michigan as CPS Camp No. 42. 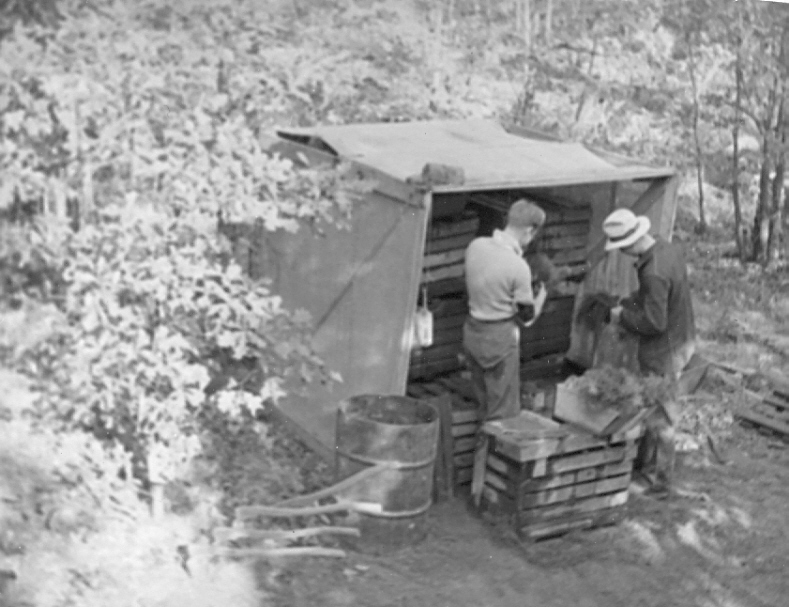 The largest number of Brethren base camps worked with the Forest Service. Men fought fires in fire season and did preventive or preparatory work for fire control. They spent many days building roads and trails into back country, felling dead trees known as “snags”, building and maintaining lookout systems. For more information on work in Brethren forest service base camps, see Leslie Eisan, Pathways of Peace: A History of the Civilian Public Service Program Administered by the Brethren Service Committee. Elgin, IL: Brethren Publishing House, 1948, pp. 74-84; for life in base camps, see pp. 112-187. See also by Mulford Q. Sibley and Philip E. Jacob, Conscription of Conscience: The American State and the Conscientious Objector, 1940-1947. Ithaca, NY: Cornell University Press, 1952.